The search is on for a new offensive co-ordinator for the football team at Queen’s University, after the announcement Wednesday that Ryan Sheahan will be leaving his father’s coaching staff to become the offensive co-ordinator and assistant head coach with the University of Calgary Dinosaurs. “Ryan is one of the top offensive coaches in Canada,” Calgary coach Wayne Harris said. “He has developed some of the top quarterbacks in university football and is known for installing innovative offensive schemes. Sheahan inherits an offence that was among the most potent in Canada last year, one that led the nation in total offence and scoring. Led by quarterback Andrew Buckley, the Dinosaurs were the first team in Canada West history to amass more than 5,000 yards in a season. In his first year as a starter in 2014, Buckley won not only the Hec Crighton trophy as the most outstanding player in the CIS, but the Russ Jackson award as the player who best displays academic achievement, football skill and citizenship. He was one of three first-team all-Canadians on the Dinos’ 2014 offence. The Dinos won six consecutive conference championships through 2013, and they have won 15 in all since joining Canada West in 1964. There have been four national championships in nine appearances in the Vanier Cup game, including a victory over Queen's in 1983 and a loss to Queen's in 2009. A quarterback during four seasons with the Gaels, 2001-04, Sheahan doubled as the team’s kicker in 2004, when he was the team’s leading scorer. He left to play professionally in Europe, and he was player-coach for a club in Denmark in 2006 before joining the Gaels coaching staff in 2008. He was the team’s quarterbacks coach in 2009 when Queen’s won the Vanier Cup. 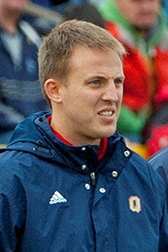 In 2012 Sheahan was hired to coach the running backs with the Hamilton Tiger-Cats of the CFL, and after one year there he returned to Kingston to become the Gaels’ offensive co-ordinator. Queen’s reached the Yates Cup final in 2013, but missed the playoffs last year. Sheahan will join the Dinos in time for their spring camp at the end of the month. Calgary’s coaching staff has undergone a major overhaul since Blake Nill announced he was leaving in December to become head coach at the University of British Columbia. Harris, whose father, Wayne Harris, Sr., was an outstanding CFL linebacker with the Calgary Stampeders in the 1960s, was named interim head coach in January. A He’s been a member of the Dinosaurs coaching staff for 16 years, the last four as defensive co-ordinator. The Dinos were 6-2 last year and advanced to the conference final, where they were defeated by Manitoba. Queen’s also announced Wednesday that Grant Shelske, a member of that 2009 national-championship team who, in the past two seasons, has served the team as a full-time defensive assistant, recruiter and video co-ordinator, will be leaving to pursue graduate studies.